While the FPS genre has improved steadily over the years, with multiple landmark titles that represented huge leaps forward (Goldeneye: 007, Half-Life, Halo, and Call of Duty 4: Modern Warfare come to mind) the side-scrolling action genre that Super Metroid seemed to perfect has never really gotten any better from that point forward. 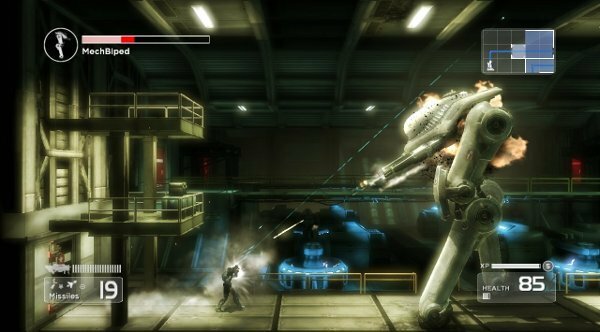 Chair Entertainment has been straight up from the start that their newest XBLA outing, Shadow Complex, is unashamedly inspired by Super Metroid. The thing that no one expected however, is this: Shadow Complex is the Half-Life 2 to Super Metroid's Doom. 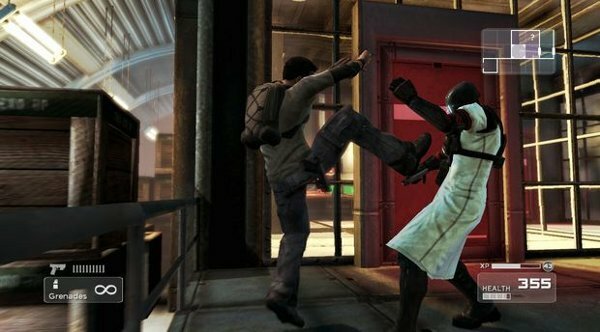 Some of you might be hung up on Shadow Complex's $15 price tag. Get over that now because this one is worth much more than the asking price. Shadow Complex isn't actually a new IP. Based on the universe created in Orson Scott Card's novel Empire, the game's story works as a tie-in to the story of the upcoming sequel to that book, due out this fall. "Empire" tells a tale about a civil war between extremists on both the right and left sides of the political spectrum that eventually pulls almost everyone into the fight on one side or another (Side-note: I actually read the book in preparation for this review and it's totally worth checking out. Card knows how to craft a page-turner). The story of Shadow Complex is told largely through cutscenes, all of which are in-engine and look about as good as cutscenes in Gears of War, just like the rest of the game. The graphics are definitely worth mentioning. Despite the fact that this is a $15 Xbox Live Arcade game and that your character (Jason Flemming) is confined to movement along a 2D plane, the game looks like a full retail release. Weapons can be aimed at any specific point in a 360 degree circle around Jason, and whenever an enemy happens to be in the background or foreground the aiming auto-corrects to shoot in his direction. There are even some turret-manning segments in which the camera simply moves behind your character to turn the game into a totally great-looking 3rd-person shooter. Aside from a large number of air ducts that you'll be crawling through, environments are colorful, varied, and detailed. Every room is impressively unique, and the developers have done some really cool things with the design of the complex. For those worried about getting their money's worth out of the game, I can confirm that it took me just under five hours to beat the game, and my final time upon getting 100% of the 120+ hidden items had me clocking an overall playtime of eight hours. This is largely because the in-game map is HUGE. If you play through the game without constantly going back to find hidden goodies, there's really no backtracking. Even if the game directs you (using a blue line on the map) back through an area that you've already visited, it's likely that the area has changed in some way, whether that be physical changes to the environment itself, or new challenges in the form of enemies. It's once you actually beat the game and go back for final sweep for hidden items that backtracking becomes a problem. It's not the biggest problem in the world to bring up, but some sort of Castlevania-esque teleportation system would've made getting 100% completion a lot easier. I forgave the game for this grievance after collecting all 12 Gold Bars and all 12 Electronic Passkeys, both of which rewarded me with prizes that were AWESOME. Those final two hidden prizes in the game are definitely great, but Shadow Complex does a fantastic job of dealing out the goods at a steady rate over the course of the whole experience as well. In your romp through the game you'll acquire grenades (blows up green doors/whatever), the foam gun (blows up purple objects and can be used to create bridges), missiles (blows up red stuff and kill baddies quick), a hookshot (makes the game like Bionic Commando: Rearmed but with jumping), two upgrades to your basic jump, the ability to run at hyperspeed, and a couple other things that are better left unspoiled. Your character will also level up the more you explore, the more items you find, and the more enemies you kill, so by the end of the game when you've found all 10 Health upgrades, all eight armor upgrades, all the various packs that give you more ammo for each weapon (infinite missiles, anyone?) and all of the gun upgrades, you'll be swinging through the environment at crazy speeds blowing up everything in sight without any fear of death. This makes the biggest challenge towards the end of the game the puzzles that keep you from all the precious hidden items, but perhaps that's appropriate, as by that point in the game you might not feel like shooting dudes much more. 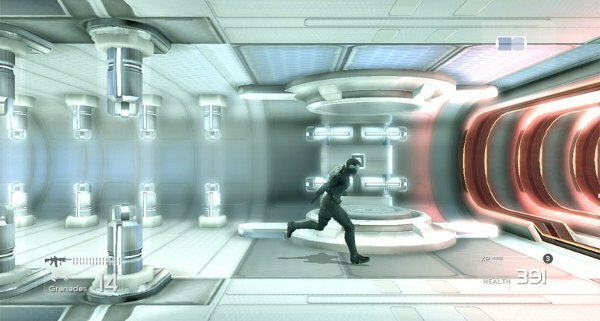 I only encountered two minor glitches in Shadow Complex, both of which could be solved by simply leaving the room and re-entering immediately (my character got stuck in a weird animation). However, many of the boss battles didn't have that epic feel that gamers hope for, as they were all a bit easy to beat through janky means. I defeated one boss by simply hanging from the ceiling directly over his head using my grappling hook and shooting him in his robot face until he died. One boss that rolled around the environment like a wheel could be avoided entirely simply by standing in a corner and spamming grenades everywhere. Only the final battle had a really great feel to it; the rest of the boss battles are woefully outshone by the fantastic quality of the rest of the game. Despite these flaws, it's honestly hard to find anything that this game doesn't do better than Super Metroid. The graphics are way better, the controls are more fun and allow more freedom, the environments are way more attractive, the level-design is better, there's more variety from room to room, and the end-game rewards are way more cool. In fact, if nostalgia isn't influencing your view, it's easy to say that Shadow Complex is simply a better game. That's a controversial statement, and I suppose that it's all subjective, but on a point to point level it's a legitimate argument. Shadow Complex is the leap forward that side-scroller fans have always wanted. Quite frankly I can't think of a better compliment than that.